Vista Photo Album - Software Features! ..Vista Photo Gallery is a great photo album software that is friendly to amateur web developers ... Vista Photo Gallery is strictly better in both easy-to-use and result..
"..VistaPhotoGallery is more human in user experience and more convenient to make photo album... It's easy like the Picasa and even simpler.."
Vista Photo Gallery helps you to create photo album for your website with ease. Just drag-&-drop your photos or folders with photos and press "Publish" to get your web photo album ready! Every picture added to digital image album will be automatically ordered by date and time. Organize your images using tags. 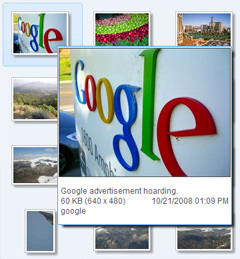 Add captions, rotate images, change the size and quality of your photos in your web photo album. Get detailed information about your photos: digital camera model, exposure time, focal ratio, focal length and much more..
One of the many useful features of Vista Photo Gallery is it's built in ftp client. This means that you can upload your gallery to your web server in the same environment in which you are developing it. 1) Start Vista Photo Gallery. 2) Create your gallery or open your project. 3) Click "Publish Gallery" button on the toolbar. 4) In the next step you have to specify the technique you are going to use to connect to the server i.e Publish to folder / Publish to FTP server. In our case we are using FTP. 5) In the 'FTP Location Manager' window specify your domain name without the 'http' protocol, for example: domain.com and not http://www.domain.com. 6) Then enter your FTP username and password. 7) To test the connection, simply click the 'Test FTP Location' button. Then click 'OK'. 8) Now you should specify the remote folder path where you are going to upload the files i.e 'www/gallery'. 9) Then simply click 'Publish'. 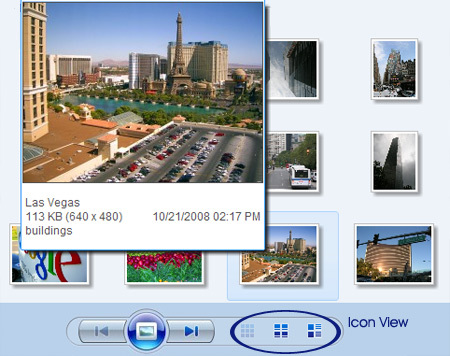 * Vista Photo Gallery main area has three display modes: small icon, large icon and details. Small Icon - an arrangement of icons in a main area which uses smaller icons and alphabetizes across the window. Large Icon - an arrangement of icons in a main area that uses a larger icon. Arranged alphabetically across the window. Details view - shows the picture properties across the main area, like Caption, Date modified, Size. * On the fly filtration of your pictures by tags, date and folders. * The tooltip with oversize picture and detailed information appears when you hover over the pictures. * Full size picture preview. Your picture will scale proportionally when you resize your browser window, and the picture will always stay at the center. Digital image albums created with Vista Photo Gallery are fully compatible with all modern MAC and Windows browsers - Internet Explorer, FireFox, GoogleChrome, Opera, Safari, Netscape..
Vista Photo Gallery doesn't require any server side configuration, so feels good on any webhost. Take pleasure in your photos online with Vista Photo Gallery! Make photo album of your dream in seconds!